Beef noodle soup on the go. Regular readers of the What the Fork know I’m always on the lookout for regional Chinese food — for unusual dumpling varieties, obscure noodle dishes, or a better-than-average version of stinky tofu, which has long been my white whale. 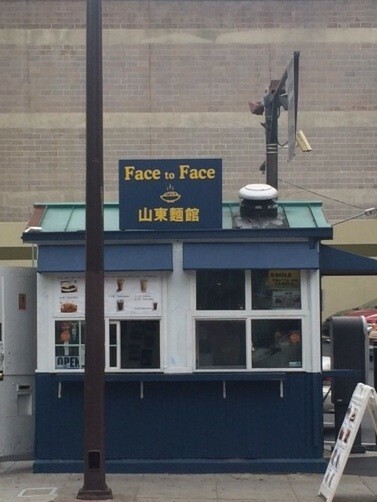 My latest discovery: Face to Face, a Shandong noodle shop located in a converted parking attendant booth in downtown Berkeley, at 2109 Milvia St. (between Center and Addison streets) — the spot formerly occupied by Tsunami Dogs. When I stumbled on Face to Face on Saturday, the friendly woman who appeared to be the owner told me the shop has only been open since Thursday. Given its location in a parking booth, it goes without saying that this is a tiny, barebones operation, with most of the cooking done off-site in a commercial kitchen. 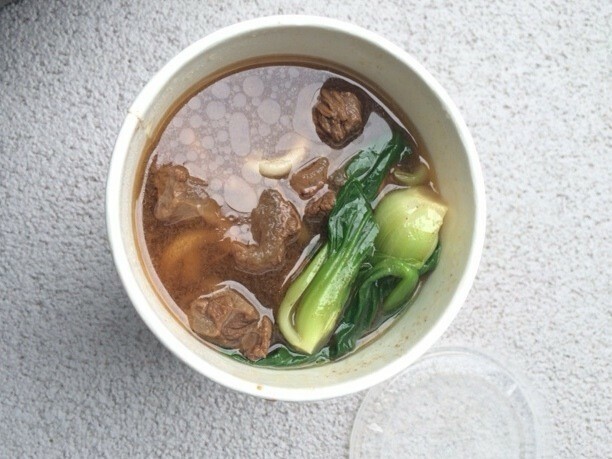 For now, the menu consists of just four items: beef noodle soup, chow mein, potstickers, and a beef wrap. There are also a couple of milk tea options. Might this be Berkeley's smallest noodle shop? Shandong is, of course, famous for its dough-based cuisine, so if someone from that province opens a noodle shop, there’s no question I’ll give it a shot. That said, I was wary of the “Asian beef wrap” ($4.50) — a variation on what most Northern Chinese restaurants would call a Shandong beef roll — when it came wrapped in an ordinary flour tortilla instead of a traditional Chinese pancake, and when the filling was garnished with raw onion and lettuce instead of scallions. But the slices of beef were pretty great — tender, replete with gelatinous bits of tendon, and coated in a pleasantly sweet hoisin sauce that soaked through the paper bag as I ate. Meanwhile, I was disappointed that the noodles in the beef noodle soup didn’t appear to be made in house, and the chunks of beef shank and tendon probably could have used another half hour of gentle simmering. Still, the mild broth had a soothing, wholesome quality — lighter on the star anise than the Taiwanese style, with a bit of a tomato tang. All in all, not bad for a $5.50 bowl. Face to Face’s listed hours are Monday through Saturday, 10 a.m.–4 p.m. I’ve yet to find a phone number or any online presence for the shop, so those who are curious will just have to swing by and check it out in person. It's conveniently located right around the corner from the Saturday Berkeley farmers' market.